We are halfway done with our semester here in Cape Town, and that means Spring Break! Here they refer to it as vac, short for vacation, and we get a week off of classes. So that means time to travel! On Saturday we took an early flight to Kruger National Park and were met by three safari cars at the airport. The cars were trucks with raised rows of seats in the back with open sides so we could have the best views of the animals on the safari. We then went straight into the national park, the largest reserve in South Africa, and went on an afternoon game drive, hoping to spot the Big 5. The Big 5 include Elephants, Buffalo, Lions, Leopards, and Rhinos. 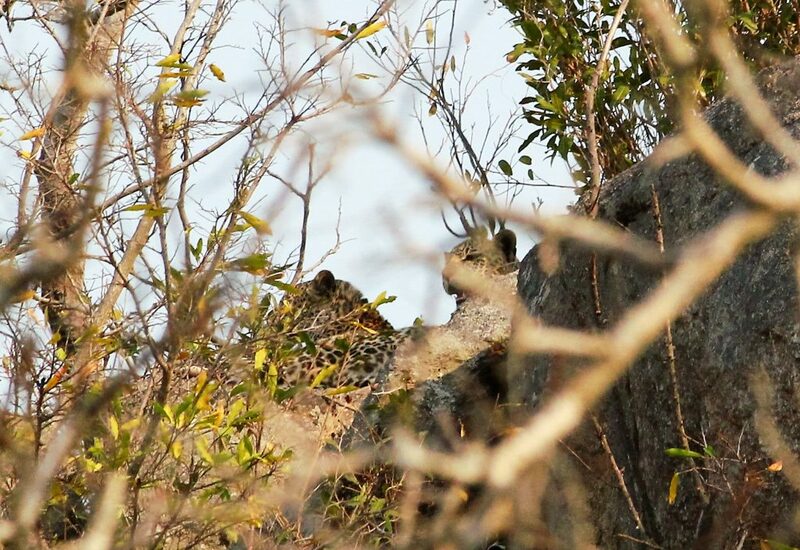 Only a few minutes into the drive, one of the guides spotted two leopards up on a rock behind some bushes. It wasn’t easy to spot them, but after looking for a couple minutes I was able to see them moving around on the rocks. Our guide, David, told us that leopards are the most uncommon of the big 5 to spot, so it was pretty cool that we saw two right off of the bat! After admiring the leopards we kept driving through the park and were able to see a herd of buffalo crossing in front of us, lots and lots of impalas (a type of antelope), a beautifully colored bird called known as the lilac breasted roller, some zebras, a hornbill (the type of bird Zazu in the Lion King is), a group of baboons, and some hyenas with their pups. It was crazy to see so many animals just in our first of four game drives and seeing each in their natural habitat and how they behaved was amazing. When observing the zebras, they were standing in pairs, side by side but facing opposite directions. David explained that it looks like they are trying to hug each other but they are actually protecting each other and watching out for predators. It was neat seeing them stand like this! The next morning we got up before dawn and headed on our first game drive just after sunrise. Because it gets so hot during the day, the animals are more active early in the morning and later in the evening. So, people usually are luckier with animal spottings during these times. Despite starting our drive very early, the park was pretty quiet and it took a while to sight some animals. However, throughout the morning and early afternoon we got to see quite a lot. Some of the highlights were seeing a family of giraffes snacking on some trees just feet from our car. We stopped to watch them and they crossed the road right in front of us to start munching on a new set of trees. It was so cool being so up close to them and watching them interact with each other! Not much longer we encountered a rhino nearby the road, and stopped to look at him. David explained to us how serious of a problem rhino poaching is, even in Kruger. Poachers will come and remove the horns of the rhinos and leave them to die, which is bringing them closer and closer to extinction. This was only one of several rhinos we saw throughout the day though, so it was reassuring seeing so many in one day. A little later on we spotted a couple of monkeys across the road from us. They then ran across the road and into a tree directly next to us. 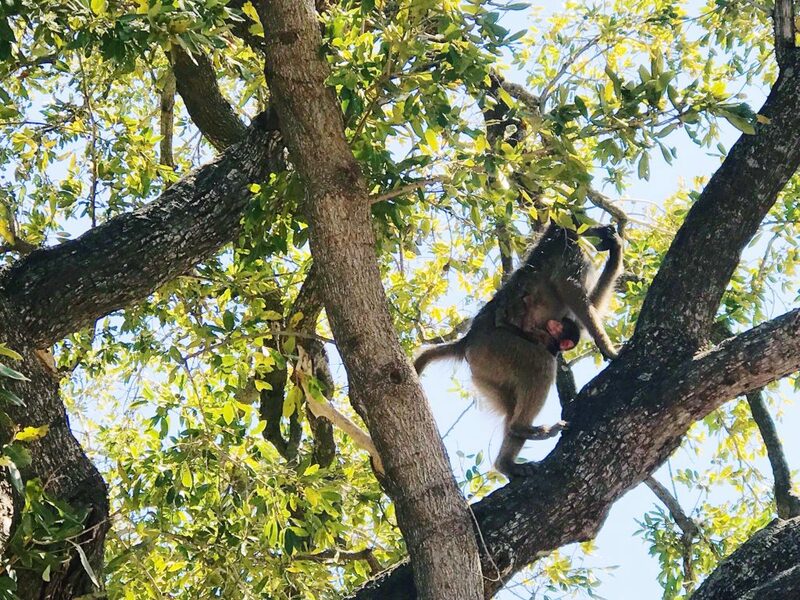 We were watching the handful of monkeys climb the tree when someone in our car noticed more across the road, and a few dozen monkeys started running from deep in the bush out across the street into the tree to meet up with the others. It was crazy to see so many monkeys running together at once; some of them were carrying babies on their backs and stomachs as well, which was a cute bonus. Another highlight was seeing a honey badger, which might not sound like it would be exciting, but they are one of the most rare species in Kruger! They are nocturnal, so seeing one during the day (seeing one at all!) was pretty neat. After a quick break back at the lodge for lunch, we got picked up for an evening game drive on our way to eat dinner in the bush. We headed out right before sunset, so it got dark pretty quickly. Since it was dark, the car came equipped with two heavy duty flash lights that we used to try and spot some animals. A little into the drive a couple of girls said they saw something in a tree, so the guide backed the car up to where we could see the tree and we shined the lights towards it. It turns out that there was a leopard sitting in the tree eating whatever prey it had just caught. 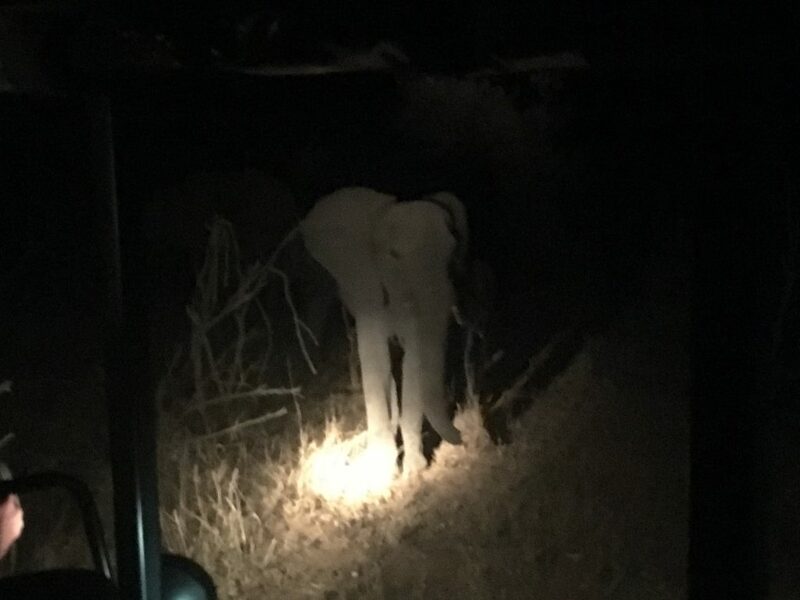 Even the guide was amazed that we were able to see such a cool sighting at night. Seeing another leopard was crazy in itself, but seeing one in a tree at night was even crazier! We also saw a family of elephants a little later on, including two babies. One of the older elephants saw us and started to approach the vehicle and raise his trunk at us as a way of protecting the others, so we headed out to let the elephants be. We made our way to the middle of the bush where a traditional South African meal was being prepared for us. We got out and there were a couple of guards holding guns that were there to watch out for animals during our meal (we even had to have a guide walk us to the bathroom with a gun if we had to go). The food was delicious and the view of the stars from the middle of the bush was incredible. We could see them so clearly and were able to point out a few constellations. It was such a unique experience being able to be out in the bush and made for a great end to our safari experience! Even though we didn’t get to see all of the Big 5, since we didn’t spot a lion, being able to experience African wildlife so up close and in their natural habitat was one of the coolest experiences of this semester so far!